The Flex 8 Elbow Extension Stabilizer is designed to provide therapeutic relief for patients with chronic pain caused by epicondylitis, anterior capsulitis, biachioradialis strain, and UCL injury. The product's neoprene sleeve provides compression and allows device to breathe. It washes easily and air dries. The elastic strap wraps in figure eight to provide stabilization. 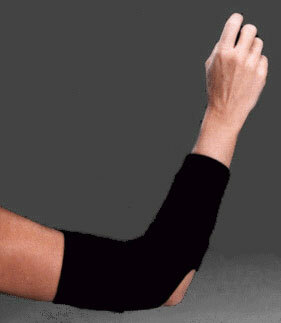 It limits excessive stress on elbow and adjusts easily for desired correction or support. Additionally, the product is designed to support ligaments and tendons. Brown Medical Industries, 1300 Lundberg Drive W., Spirit Lake, IA 51360-7246. Tel: 800-843-4395; Fax: 712-336-2874.